Looking for Unscheduled Positions and the Manual-Assist Scheduler | by Paul Ziino – WELCOME TO OUR INTERNATIONAL SUPPORT! After you’ve run the Automatic Scheduler, many programmers will look for the unscheduled positions in their log—positions the Auto-Scheduler was unable to fill due to unbreakable rule violations, lack of options, or manual clock positions. There are several ways to do this. From within the Schedule Editor, you can click on the Schedule QuickView icon. This opens a graph that shows all the unscheduled positions. Green hours have no unscheduled positions, yellow hours contain the number of unscheduled positions indicated, and white hours have not yet been auto-scheduled. On February 28th we have one unscheduled item in the 8AM hour and two in the 3PM hour. To jump directly to those items, just double-click on that number and the Schedule Editor will take you to the top of that hour. Then scroll through the hour to find the unscheduled positions. You can open the Schedule QuickView as often as necessary to find all the unscheduled items. You can open the same graph by clicking on Dataset/Schedule/QuickView. Another place you can see the Schedule Quickview is by clicking the Schedule Calendar icon in the Toolbar, then right-clicking on any date and selecting “QuickView Selected Week”. Once you are in the Schedule Editor, you can jump directly to the next or previous unscheduled position by clicking the Jump to Previous Failure or Jump to Next Failure icons while holding the Control button on your keyboard. If no other unscheduled items are available in the log while headed in the previous or next direction, a “No matching rule failures found!” message will appear. There’s a cool feature in MusicMaster that can help you eliminate unscheduled positions. It is called Manual-Assist Scheduling. By implementing this feature, you effectively tell MusicMaster that when it would normally leave a position unscheduled that it should pause and let you fill that position before continuing the automatic scheduling process. When MusicMaster is auto-scheduling a day, it fills all the positions for that day whenever it can find a song that passes the unbreakable rules and leaves unscheduled positions when it cannot. So then you’re forced to go back into the log to look for a suitable replacement. Using the Manual-Assist Scheduler allows you to edit the log as MusicMaster is scheduling it by choosing the best song from within the schedule order—you’re choosing songs from the same list in the same order that MusicMaster is testing them. When you launch the Auto-Scheduler, click the Options tab. Here you can turn on Manual-Assist scheduling. By default the style is set to None (Disabled). But you can turn this on simply by selecting a style. 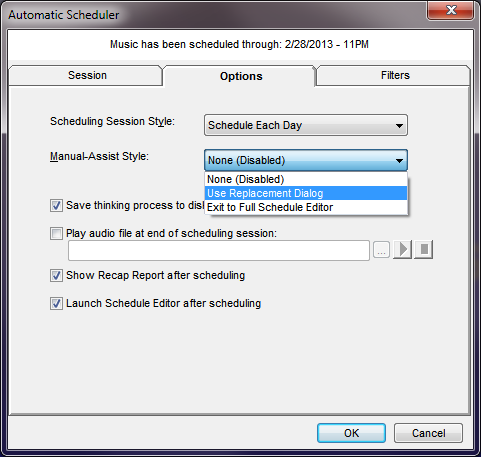 Use Replacement Dialog will open a display that allows you to choose a song, and once you’ve done that, the automatic scheduling session will continue. When you select the “Exit to the Full Schedule Editor” option, this takes you to the same screen you are accustomed to seeing when editing the log. It opens the replacement box to show you what songs are being considered—these are the same songs in the Schedule Order that the Auto-Scheduler was considering (when Show All Available Songs icon is selected). 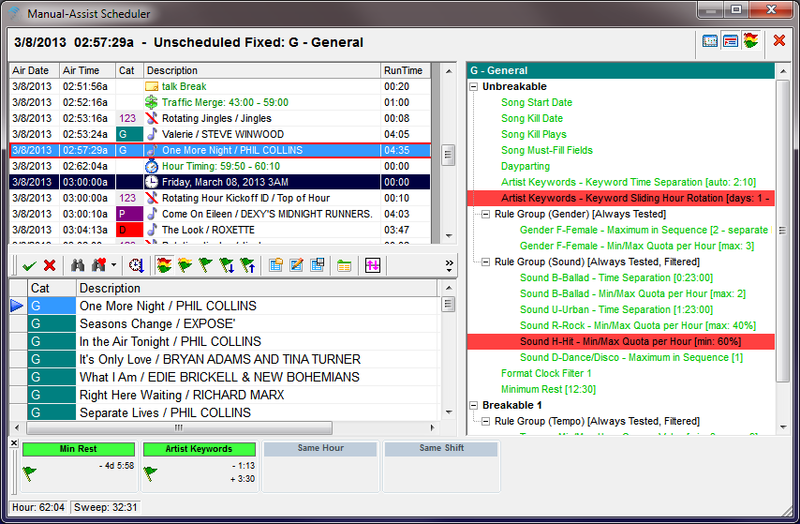 Once you choose a song, MusicMaster displays the Schedule Editor screen as normal allowing you to make any other edits you wish. You can then click Resume to go back to the auto-scheduler, Suspend to cancel the Manual-Assist Scheduler and just resume auto-scheduling without pausing on unscheduled positions, or Cancel to stop the auto-scheduler session entirely. As long as you haven’t suspended or cancelled, you can get back to where the Manual-Assist Scheduler paused by clicking the binoculars icon to “Find the original element position”. From there you can resume the auto-scheduler as you wish. Another advantage of using Manual-Assist Scheduling is that it will let you see in real-time what rules are causing unscheduled positions, thus allowing you to make appropriate adjustments to the Rule Tree. 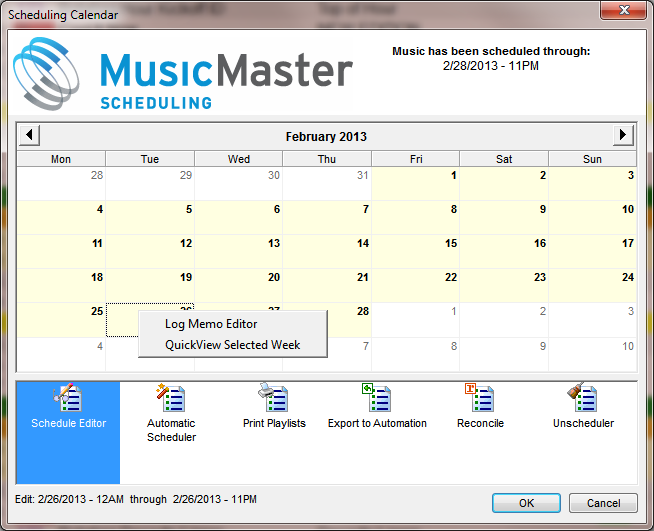 If you have any questions on this or any other MusicMaster-related topic, make sure to contact your Music Scheduling Consultant or email support@mmwin.com.